Make Spring Come Early! Treat yourself to live theater while you’re here! 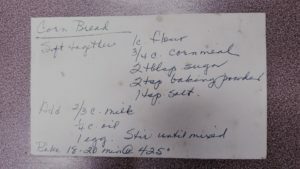 Looking for a tasty, quick bread to supplement a fall soup? 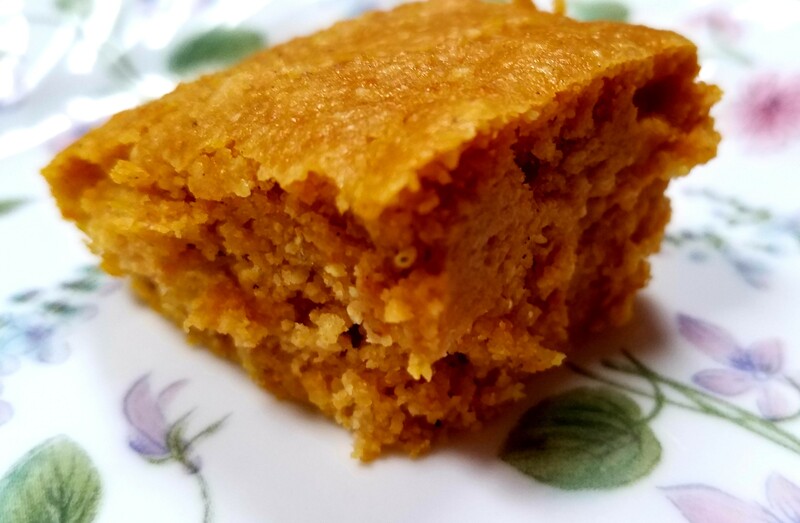 After hearing mention of pumpkin cornbread in the movie “Midnight in the Garden of Good and Evil” set in Savannah, Georgia, I went to my Aunt Gen Lehman’s cornbread recipe and made some minor alterations. It got rave reviews served with old fashioned ham and beans! Oil a 8×8” or 9×9” pan. If you buy “cornbread mix” start with 1 ¾ cups of it and1 ½ tsp. pumpkin pie spice. Then add the liquids. Stir until moistened, no beaters needed. Pour into oiled pan. Bake 18-20 minutes @ 350. Remove when the center springs back from your touch. Makes 8-10 pieces. For a wedding shower gift, my aunt Genevive gave me a box with handwritten recipes. That was long before recipes.com!